Today I’m 24 years old and oh how time flies! Am I the only one who still feels like they were in high school like… yesterday? Thinking back to where I was one year ago today makes me realize how much I’ve grown and changed since I turned 23. Life has been full of so many twists, turns and surprises- I truly wouldn’t change a single second of it. God has blessed me in so many ways this past year and I hope this next one is full of just as much adventure. Thank you to everyone who has made this day so special for me!! My heart is so full and I’m feeling very thankful. I love you all!! For those of you that just started following along, I thought it would be fun to share 24 facts about me. I’ll also be sharing a birthday present gift guide that will hopefully make shopping for your friends gifts a little easier this year. Enjoy!! 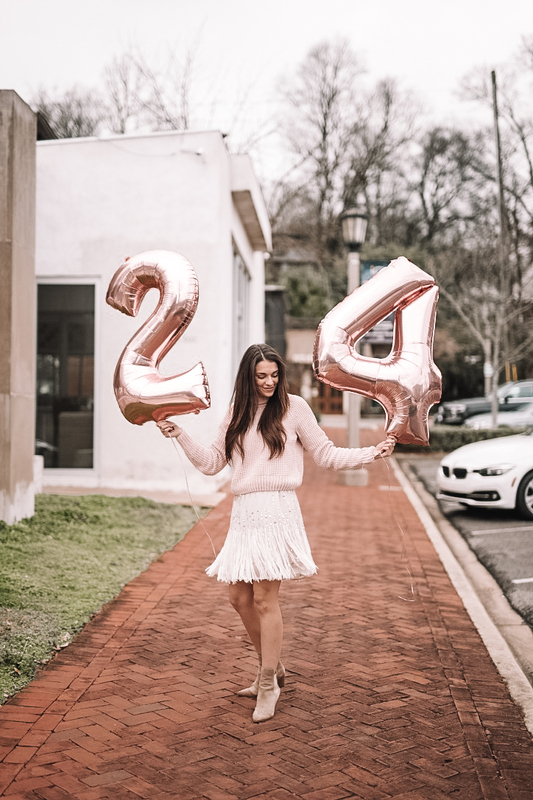 Today is my 24th birthday! DUH. I was born and raised in Birmingham, Alabama. I attended 4 years of college at The University of Mississippi and graduated on time. I studied Business Marketing and Corporate Relations (I never changed my major, I’ve always known exactly what I wanted to do). I danced from the second I could walk until I was a senior in high school. I was on the dance team in high school and got to dance in the Macy’s Thanksgiving Day Parade in NYC (we were spotlighted on TV!! One of my very favorite memories). I have two younger sisters. I’m the oldest child of three! I only blog part-time. I’m a full-time Marketing and Communications Manager for a new construction/real estate company who builds in a master planned community. I never wanted to move back home post-college and definitely want to live somewhere else for a while if I get the chance. I am an AWFUL singer. I seriously can’t hold a tune. Actually I have no instrumental talents what’s so ever. I’ve competed in 4 pageants but never placed. I’m terrified of ants LOL. Also any bug really. I rarely go a day without drinking a cup of coffee. I do NOT drink my coffee black, always with Splenda and almond milk. I thought I hated mustard and pickles until this year. Now I love them?! Freshman year of college I lost 15 pounds and haven’t gained them back since. I’ve traveled to Europe twice, both for a months length each time. I’ve visited France (Paris, Nice and Monaco), Switzerland (Interlaken), Italy (Florence, Venice, Pompeii, Rome, Genoa, Tuscany, Positano, Capri and Portofino), Croatia, The Netherlands (Budapest), Spain (Barcelona), Greece (Santorini and Oia) and Hungary (Budapest). Preston (my boyfriend) and I met sophomore year of college studying abroad in Rome, Italy. We have been dating 3+ years and adopted sister dogs from the same litter together. I was a Phi Mu in college. So was my grandma, stepmom, aunt and sister. Although, weirdly enough I hated the color pink then. Now as you can probably tell, it’s my #1 favorite color. I have hair extensions (I’ve had them for around half a year) and I love them!! My first word was agua (water in Spanish) and my mom totally thought I spoke Spanish.. haha! I have two miniature Australian shepherds named Harper and Ellie. I have a birth mark on my right arm that is shaped and looks like a potato. I was named after my great grandfather, Carlyle. He was kind of a badass!! I hope you enjoyed learning a little bit more about me today! Love you all! !